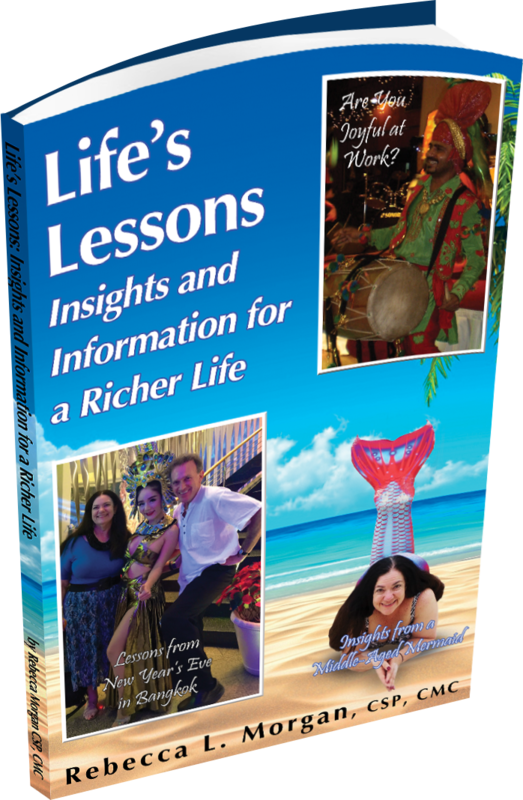 Rebecca Morgan imparts her wit and wisdom in this captivating book as she shares her experiences and discusses sage lessons with her readers. Life’s Lessons: Insights and Information for a Richer Life is both a mixture of philosophy and practical ideas. It’s a compendium of astute essays on the lessons life provides us and how to use these teachings to create a richer life. Rebecca uses her own experiences to spawn life’s lessons-giving yourself a motivational talk, taking a calculated risk, or how our lives parallel hiking a muddy trail in Molokai. She speaks as if she were sitting next to you, sharing her insights conversationally and with humor. Rebecca is simultaneously humorous and profound. This is a collection of some of my most popular articles — most have been published in national periodicals over the last ten years. My audiences had wanted to read more of my unique spin on life’s events. So I compiled these into one neat volume. Of all my writings, these are the closest to my heart. I hope you’ll enjoy them as much as the thousands of others who’ve read them in various periodicals.